Black Friday and Cyber Monday are the two busiest shopping days of the year in the U.S. As store owners, you want to optimize your site and promote your business to customers in order to take advantage of the shopping madness. From deciding what to deals to run or whether to entice shoppers with coupon codes, here’s what you need to plan for next year’s biggest buying days. The man who’s currently recovering from frostbite after standing in line all night looking for Pokémon deals on Black Friday, Bill D’Alessandro of RebelCEO.com, is here today to help answer those questions. Here are some tips for optimizing your eCommerce business for Black Friday and Cyber Monday and, ultimately, making them the best sales days of the year. Andrew: Today, we’re going to be talking about Black Friday, a handful of weeks after the date itself, but I want to dive into the holiday… I don’t know if you can call it a “holiday”. Probably can’t. It’s becoming one, kind of, in America, but I want to talk about the day, how to optimize for it if you’re an ecommerce store, really how to make it the best day of the year for you. Joining me to really dissect this is a man who currently I believe is recovering from frostbite, standing in line all night looking for Pokemon deals, which kind of surprised me, Black Friday, Bill D’Alessandro of rebelceo.com. Bill, how’s it going, man? Bill: It’s going great. Actually I was not in line but I did get an iPad on Black Friday. Bill: Yes. It was the first time that I participated in the great consumer rush. But I saved like $150 on a new iPad. Andrew: That’s awesome! All online of course. Did you do much on Cyber Monday? Bill: I bought a couple Christmas gifts on Cyber Monday. Nothing too crazy. But that was on Friday I went into Target. I braved Target with the masses for an iPad. It was kind of an experience. I felt like I needed to participate in it to be a real American. Andrew: Crazy. I can’t remember if I said it, is Cyber Monday the best day or Black Friday, but we’ll get into it. But they’ve kind of become this huge, just from Friday on to Monday, at least if you’re in the online space, really retail in general is just a melee. It’s crazy. Bill: It is crazy. I don’t know if you noticed as a consumer, but I noticed as a consumer this year, it seemed to me in past years there was Black Friday and there was Cyber Monday. It seemed to me this year that it kind of just all ran together. It was like Cyber Weekend. Brands ran basically the same deal on Friday and they just ran it for three days and ended it on Cyber Monday. Did you experience that? Did you feel that way? Andrew: Yeah, I felt that way too. We’ll kind of get into structuring different deals but we kind of took a little more of a stair step approach and stepped it up for Cyber Monday. But yeah, I felt like it was just a huge four-day shopping spree holiday. It was crazy. Andrew: So I’ve got to ask you, and maybe this is a sacrilegious question to ask given that we’re both in ecommerce, but do you have any cognitive dissonance profiting so much from what in some ways is kind of, it’s great for business but in some ways it can be a pretty gross holiday in terms of just mass consumption and worshipping stuff and just… I tend to be a guy who, not a huge fan of buying a bunch of stuff, which is kind of ironic given that I’m in ecommerce. It’s such a good holiday and such a good weekend on the business side, but any kind of issues with it on kind of a deeper level that you have? Bill: I don’t think Black Friday is the day for philosophy. I don’t know. I agree with you in that, yeah, generally you should spend your money on experiences instead of things and it’s more enjoyable. But the fact of the matter is we’re not going to fix the American consumer, so you might as well just get on board. 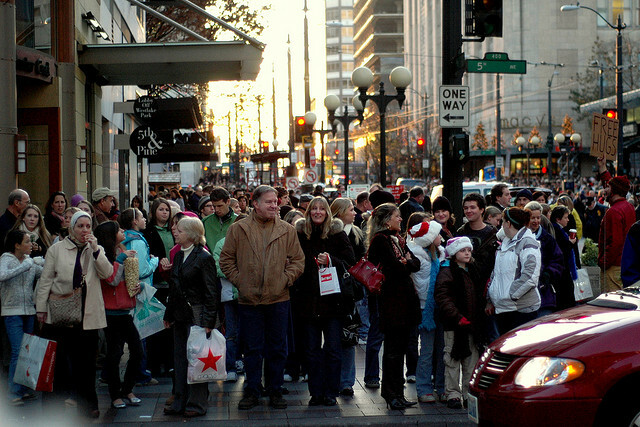 People are going to buy a whole crapload of stuff that weekend anyway and they’re looking to buy Christmas presents. Christmas is the time of year, Q4, where people buy everything. You might as well get on the train. You saw a couple brands like REI was closed on Black Friday this year with their hashtag #OptOut side. They got some really great PR for that. Andrew: But they didn’t do it for the PR, Bill, let’s be honest. It had nothing to do with the PR. Bill: Nothing. Of course not. No, it doesn’t bother me. People want to buy their stuff either way and they want to save some money. Yeah, I’ll give them a good deal. Andrew: If you are looking for an ethical discussion on this topic, look elsewhere. We’re going to dive into the actual mechanics of how that works. Let’s go ahead and get into the meat and potatoes for today’s episode. Andrew: So, Bill, I think it’s interesting, Cyber Monday, especially Black Friday has been kind of a staple for awhile, but I feel like you can’t ignore Cyber Monday anymore. For us, it was our first year of really diving in and taking a very intentional approach to market, which seems kind of funny, but last year we were in the middle of a big migration, didn’t have the bandwidth for it. Years before it was a thing, there was Cyber Monday, but it wasn’t really a big thing. But I feel like Cyber Monday, at least for us, it’s a thing now, almost as big as Black Friday and it’s definitely matured. Bill: Oh, yeah. I’m actually surprised to hear you say that. Cyber Monday, I think, has been a thing for a couple years now. We did Cyber Monday with my brands last year and did very well. In fact, I think Cyber Monday it seems like this year, as I alluded to earlier, was actually less of a big deal than it’s been in the past year or two because I felt like it ran together with Black Friday, like with the whole weekend. Last year I specifically remember just so many brands doing big Cyber Monday things and so many online brands sitting out Black Friday almost in prep for Cyber Monday. Andrew: That’s crazy and maybe that’s just me totally personalizing it because we weren’t as involved on the promo side last year. It was interesting some national stats, like sales were up 16% year over year on Cyber Monday from last year – the biggest online sales day for firms ever, coming in at just over $3 billion for the day, which is wild. Interesting fact, 26% came from mobile, which is kind of crazy. Bill: I saw that article. That is crazy. Andrew: Yeah. It’s kind of mindblowing. Personally on our side, I’d be interested to hear how it was for you, Bill. Our conversion rate was 3x what it normally was. We had our best day ever in terms of individual orders on Monday in the whole eight-year history of the business. I didn’t expect it to be like that, which was phenomenal. Bill: Then Cyber Monday we had about a 10x revenue day, roughly. Maybe closer to 15x versus a normal day. That’s good but last year we ran Black Friday and Cyber Monday and both of those days were 8-10x. So I’m kind of thinking that next year we’ll go back to two different deals instead of just the one because if get 8x twice or 10x once, you’d rather have the two days. Andrew: Yeah, it’d be interesting… this is the kind of thing you can’t split test obviously because… maybe you could a little bit but it’d be difficult to try to figure out doubling down on one day versus splitting across the two. You can make the argument that the more emails that you send out, the more promos, the more likely you can get people to buy. You can also make the argument, probably for someone like you, especially, Bill, where you’ve got a very loyal email list, that they’re probably not going to buy both days, that you’ve got a fixed number of people who are going to buy and they just kind of split up depending on when you focus on them. Bill: See, that’s what I thought. So that’s why we figured that we would get them just kind of all at once and we’d build up the excitement and get them all at once. But it seems like I was wrong about that because maybe some people are doing their shopping Friday or some people say they’ll wait until Cyber Monday. I think having a presence on both days next year is what we’re going to do. Andrew: We structured it kind of a stair step approach. What we did was on Friday, rolled out a coupon just pretty much saying, “Hey, 10% off everything for the next four days.” You kind of talked about the four days just kind of merging all together. We took that approach. So 10% off everything with a note to kind of say, “And on Monday, stay tuned because we’ll have some screaming deals on a few select items.” Then Monday rolls around and we sent out another email and reminds people about the 10% discount, but then we listed a handful of our, either items that were really popular, just screaming good prices, or items that we could get really great discounts on that could discount even deeper and kind of throw out there for people to have at. Bill: So did you go back to your suppliers and say, “Can you work with us?” so you could pass through a discount? Or did you just eat the whole discount? Andrew: We did. We went through and we asked if we could get a discount, and then we also looked for items that they were already really deeply discounted, trying to get rid of, and we took a two-pronged approach for that. Bill: Nice. So you didn’t have to just eat all of it straight out of your margin. Andrew: Not all of it, yeah, but we definitely ate some of it. I should have looked at the margin for the day before we hopped on. It was definitely lower but one thing we tried to do too with the discounting is for some of those items that we deeply discounted, where we maybe didn’t get a big cut from the manufacturer, make sure that we were selling items that, A, already we had a great margin on and, B, sell items that were a little more prone for add-on items. So we deeply discounted antennas, which you can add springs and quick disconnects and mounts and all these kind of things that a lot of times people add on. So even if you don’t make money on that, as a loss leader, you’ve got something where it’s not killing you. Bill: Yep, that’s makes sense. Nice. Andrew: Yeah. What about you, Bill, on a halo effect in terms of what you saw on Tuesday, Wednesday, throughout the rest of the week? Bill: Our deal was 15% off and we just ran it on Monday. We did 15% of everything and then we threw in a free lip balm for every order, which is a $6 item. That was a pretty big deal and we don’t ever offer a better deal than that. That’s the best deal we offer every year and I think the customers know that, 15% is where we are. They’ll never see anything better than that. That’s our good deal. We came out with that on Monday, and as I said, we had a good day. Then what we did, which I’d recommend that you try next year, is extend it into Tuesday. We sent once in the morning on Cyber Monday, and then we sent again at 8:00 p.m., four hours left email. Then we sent again on Tuesday morning that said, “Cyber Monday extended 24 hours.” We had a 4x day that day, on Tuesday. Again, though, I think that is piggybacking on the strength of my email list because we keep our email subscribers engaged and we get good open rates and stuff. But if you do have an engaged customer base, I think a Cyber Tuesday extension can do well. You still have your scarcity at the end of the day on Monday, and then give them one more day for the people that didn’t quite get there. I mean, we got a 4x day out of it, so definitely worth doing. As far as since then, it’s been pretty dead. We’re now recording this on Friday, December 4th, and so Wednesday and Thursday have been like 25% of a normal day. Bill: I know. I know it’s depressing. Andrew: It is. It’s emotional. Bill: You start going, “Will they ever come back? Did I pull six months of sales for it into this one day?” Yeah, it’s nerve-wracking. Andrew: It is. One thing that’s interesting, maybe flipping our perspective a little bit, you mentioned on Black Friday you did some shopping. I didn’t do any shopping on Black Friday but Cyber Monday I bought a ton of stuff that I had been kind of on the fence about. Not on the fence, just purchases that I had been lazy about, had been putting off. I won’t bore you with all the details but, yeah, probably half, maybe three or four or five items, which for me is an enormous shopping day. It’s interesting. I wonder if… obviously it kind of goes back to that discussion about discounting. Discounting can genuinely drive more sales and more revenue and more profits if you do it right. But if you’re not careful, you train people to wait for that day, because I was totally trained. There were three or four items, I was like, “Well, I was going to buy in the last couple weeks, but I’ll wait until Black Friday or Cyber Monday, pick them up.” It’s interesting. Do you have any thoughts on that in terms of balancing? How big of a discount do you feel like you should offer? Bill: Yeah, two thoughts on that. One, I definitely think you need to offer, I would do something. I would offer some sort of discount because people are waiting for it. If people are thinking, “Oh, I want to buy a radio, maybe I’ll just see what they have on Black Friday,” even if they’re going to buy it anyway. So offer something, but I don’t think you have to go crazy deep. I think people just want to get a deal. When you talk about people who are going to wait, this is something that we did differently this year, which I wonder if muted our Black Friday/Cyber Monday sales, is that we took more of a cohesive, holiday marketing approach. So we started our holiday marketing November 1st. We put together in fall a full six-week holiday plan that ran through November 1st, all the way through December 19th, or whenever the last day for shipping is. So we started off, we didn’t do heavy deals, but we started to do some holiday marketing, like priming people, “Gift season is coming up. Here are some gift sets.” We did a couple targeted discounts. We did a happy hour sale. Just getting people used to getting our emails and getting people in this mode, hitting them with a couple emails like, “Great winter gifts,” “Gifts for him.” We did a whole email, “Gifts for him,” and we highlighted the shave cream and a couple other scents that are guy-specific. Then we did, “Gifts for Mom,” all these things that we got people thinking. Then on Cyber Monday our copy was, “Get your Christmas shopping done. Here are all the gifts.” We highlighted our gift sets. But we had been kind of easing the people in with deals for a couple weeks beforehand. So we were warming them up to get them ready for that deal. Andrew: Interesting. Another approach, one of our forum members had this and I thought it was brilliant. His name’s Marshall Morris from a site called iheartdogs.com. They do a bunch of really cool dog-related products and give the proceeds to shelter animals. He’s very anti-discount for obvious reasons. You don’t want to train your customers to just be waiting for you. Instead of offering 20% off or something, he offered on Cyber Monday, instead of the normal contribution they made to help shelter dogs, they made twice the contribution. So the subject line of their email was, “Sorry, no discounts today. We’re giving shelter dogs the deal.” We’ll link up to the discussion. He talks about his approach and all that in the community, but I thought it was awesome. If you can do that, if there’s anyway that you can get a little creative- and this is going to vary, of course based on your niche and your market – but if you can somehow get creative without having to give up a ton of your margin, it’s going to be a huge win for you. Bill: Yeah, definitely. Another way to do that, if you don’t like discounting, if you guys know Huckberry, they’re a curated online retailer for men’s gifts. Awesome. They’re so good at eCommerce. If you want to see a brand that does very, very well at eCommerce, subscribe to Huckberry’s emails and follow what they do. For their Black Friday, they basically put a gift certificate in every order and they said that every order gets anywhere between $5-500 of Huckberry store credit. Bill: So you get them back to use that store credit for a second order. Another thing you can do is offer a discount on a future order, like earn $10 of store credit with every order placed today. Andrew: I love the randomness of it too. It’s kind of like the Diamond Candles approach where 99% of the rings – I’m guessing but maybe I’m wrong – but you’re not going to retire on them, but every now and then you get something that just… it’s that element of surprise and interest that’s more valuable than anything. Bill: Yep. You could also do… I think they also did, because all their customers are guys, they said on whatever day it was… I don’t think this was Cyber Monday, maybe it was Black Friday. They said, “We’re going to give away…” They got their hands on a bottle of Pappy Van Winkle bourbon, which is over $1,000 or something, and they said that one lucky customer who orders is going to get the Pappy in their box. They have pictures of it and stuff. If you don’t want to give everybody a discount, you can do a giveaway for everybody that orders on the day. Andrew: Very cool. Bill, I want to talk about coupons. Not necessarily discounting, but do you offer a coupon or don’t you. Of course the pros are that if you do offer a coupon, you’re not necessarily giving the deal to normal shoppers who otherwise would come in. Although maybe that’s another side topic too. Do you put a banner up at the top? We didn’t, but I know a lot of people do. Another pro is, this totally shocked me, the number of people that did not use the coupon. I know the vase majority of the people that came in over that long weekend were coming in because we were emailing them out because the sales were so much higher than normal, but it shocked me the number of people that didn’t actually use that coupon. Bill: So, what, you had a sizeable number of orders that were just full-price orders? Andrew: Yeah, probably half, if not more, of our orders they didn’t use a coupon. It was crazy. Bill: Wow. I wonder if, like your stuff is rather big ticket, right, for a consumer? Bill: Like a couple hundred bucks? Andrew: It totally depends. We have orders come in for anywhere from $20 up to a couple hundred dollars. So that’s not something that you saw? You saw almost everyone using your coupons? Bill: Almost everybody. That being said, we put the banner up. I have very strong opinions on this that you should. Instead of just decreasing the prices on everything, I think you should definitely do a coupon because it lets people realize they’re getting a deal. If they just come to your website and things are a lower price, if they don’t know like the back of their hand what the prices were before, or if you don’t make that really obvious, they’re not going to know that they’re getting a deal. I think that decreases your conversion rate. Whereas if you put a big banner across the top of your site that says, “Use code CYBER15 for 15% off all orders”, then they can type that in the box and they go, “Wow, my price just decreased $150 or something.” They get to feel that, “Press Enter, save the money”, which I think is psychologically powerful. Andrew: Yeah. Do you worry, and I think I know what you’re going to say, but we didn’t put a banner with the deals on our website because – and totally open to this is potentially some flawed logic in terms of maximizing your revenue on Cyber Monday,” but I figured if people were regularly to shop and they needed basic CB stuff, our basic products, why give up the margin on that if they were going to buy anyway? So really offer that discounted deal to people on your email list who you’re trying to incentivize who otherwise might not come. That’s a hard thing to weigh. I know Cyber Monday you probably have a lot of people out shopping anyway. You did that, so you were, I’m guessing, just counting on the fact that pretty much everyone was looking for a deal on Cyber Monday and you had to offer one? Bill: Well, my feeling was, as you said, you said they were going to buy anyway, but that’s not necessarily true. They were going to come to your website anyway. You might have significantly boosted your conversion rate by putting a coupon out there. A cold website visitor shopping around, it’s Cyber Monday, maybe I’m looking for some deals, maybe I’m willing to buy something. They end up on [inaudible 00:19:47] and they see a big old 15% off or 10% off, “Today’s the only day,” “24 hours only,” that boosts your conversion rate fairly significantly. I don’t know what else you could do to boost your conversion rate that significantly besides a big flashing discount code at the top with a time-sensitive limit. The flip side of that is why would you offer the discount to your repeat customers who have already bought from you and not offer a discount to new customers who you’re trying to acquire. Andrew: Yeah, good point, because the ones that haven’t bought yet are going to be much less likely… they’re a lot harder to earn over. Bill: Right. So if you want to be giving anybody a discount, it’s the new customers, so why wouldn’t you put it on a banner on your site? Andrew: Yeah, good point. I think we’ll probably be reconsidering that next year. Bill: Yeah, I’ve done it both ways. I’ve gotten comfortable with it, so that’s the way I roll. I see both sides of it but we splash it everywhere on the website. We want people to use it. Andrew: Bill, any crazy Cyber Monday operational snafus or mess ups? We had somebody in the forum who was talking about their Internet went out on Cyber Monday, which sounded like a nightmare, crazy stuff. Did anything happen to you guys or was it pretty smooth? Andrew: …because you’ve got to ship everything. Bill: …because you’ve got to ship everything. Andrew: Unless you’re drop shipping, and then it’s just another wonderful day. Bill: That is true. That is true. Andrew: Bill, hey, congrats on the killer Cyber Monday/Black Friday weekend. Looking forward to a good Christmas, good holiday season and thanks for coming on. Bill: Yep. Thanks, man, it was fun as always. Andrew: That’s going to do it for this week. If you enjoyed the episode, make sure to check out the eCommerceFuel private forum – a vetted community exclusively for six and seven-figure store owners. With over 600 experienced members and thousands of monthly comments, it’s the best place online to connect with and learn from other successful store owners to help you grow your business. To learn more and apply, visit ecommercefuel.com/forum. Thanks so much for listening and I’m looking forward to seeing you again next Friday.